These trees seem to be a bit unhealthy. All trees are on automatic drip irrigation three times a week for 40 minutes. They receive plenty of sunlight in the garden. 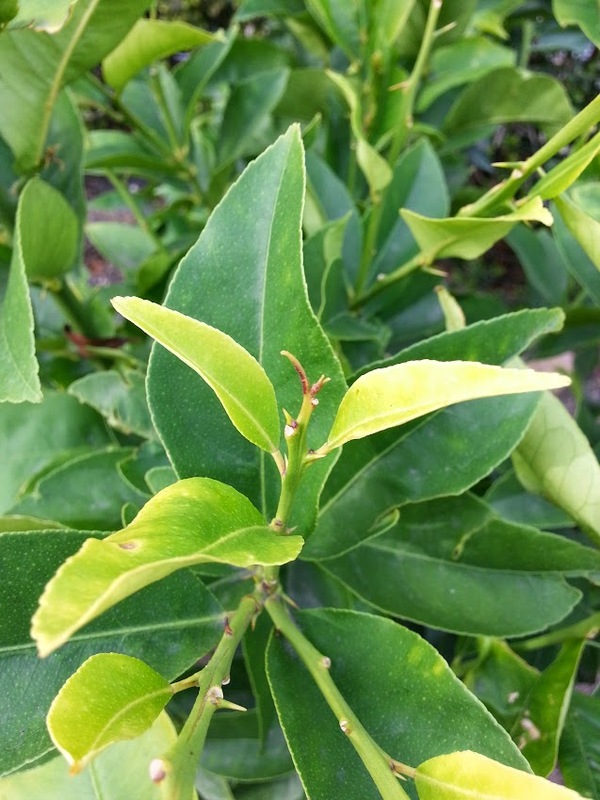 The clementine tree is struggling with yellow leaves and stunted growth. It has been about the same size for about five years. It started out in a container and two years ago was transplanted into the ground. The apple trees have bronze patches on some leaves. A five year old tree did bare fruit but in the past couple of months started getting the bronze patches. The other two apple trees are just newbies planted a year ago. The cherry trees are also newbies planted a year ago. They are definitely struggling. On 10/23/2014, they were dosed with a kelp extract from Maxicrop using one teaspoon per gallon of water. This grapefruit tree has leaves that look like the tree is lacking iron. Dosed with a teaspoon of chelated iron FeDTPA sprinkled on the surface. Then watered to soak into the soil. Date of treatment is 10/23/2014. These potted citrus trees appear to be deficient in calcium. Just added hydrated lime on 10/23/2014. Used 1 tablespoon per gallon solution.